I stare at you often as I sit in my daughters' room. You're actually comfortable, but comfort can't make up for your ugly color and ugly texture. Every day that I stare at you, I think of the day that I will tear you out and replace you with something beautiful. But you also lay there as a reminder to me. You nag me with this lesson every.day. You remind me that in 1991, just 24 short years ago... a date on the calendar that existed in my lifetime... you were beautiful. You were picked out with the utmost care and excitement. You were ooh-ed and ahh-ed over, and happy smiles filled faces as feet stepped on you for the first time. And sure, you've been worn in some, but mostly, you're still the same. It's not you who has changed. It's us. It's the people around you. Our styles, our preferences, our choices, our desires. They've all changed so quickly. And you could teach me a thousand lessons about life, truly. But the one I need reminded of over and over again right now is that the treasures of this earth will fade. They already are fading. Before my very eyes. In 24 years (and truthfully, probably even quicker than that) you went from beautiful to ugly. You went from being adored to being cringed at. And so as I move forward in my house renovation, and in life as a whole, I pray that I will never forget the lesson you have taught me, Ugly Carpet. Nothing on this earth lasts. Nothing. And to quote C.T. Studd: "Only one life, 'twill soon be past; only what's done for Christ will last." And yes, I must live in this world and make choices in this world and encounter and work with fading treasures all the time. Running and hiding from them isn't the answer. But as I live with and work with and encounter these earthly treasures, I pray that I will keep my eyes focused on the heavenly treasure: Jesus. Heaven. Hope. Grace. Forgiveness. Everlasting Love. Mercy. Peace. Freedom. Carpet's beauty may fade in 20 years. And certainly it will in 100 years. But Jesus' beauty will never fade. It will never grow old. It will never lose it's wonder. 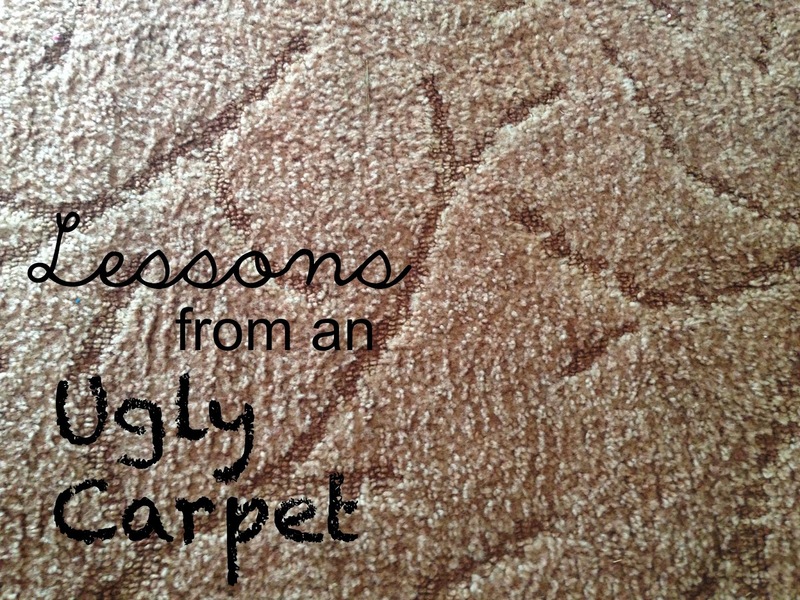 So, dear Ugly Carpet, thank you. Thank you that for as long as you cling to the ground of my daughters' room that you remind me to chase after heavenly treasures and not after earthly treasures. What a beautiful reminder! Thanks - I will now look at those old, worn, "dingy" things in my life (carpet or otherwise) in a fresh light.